SELF. SELF married Juanita Jo BOTTOMS. Juanita Jo BOTTOMS [Parents]. Juanita married SELF. Jesse Abner GRAHAM [Parents] was born on 3 Mar 1804 in , Surry, North Carolina. He died in 1887. Jesse married Martha FANNIN. Martha FANNIN was born in 1811. She died in 1894. Martha married Jesse Abner GRAHAM. George Washington DEATON [Parents] was born on 7 Dec 1879 in , Ellis, Texas. He died on 4 Aug 1971 in Allen, Pontotoc, Oklahoma. He was buried in Five Mile Cemetery, Ada, Pontotoc, Oklahoma. George married Mittie Viola HUDSON in 1906. The marriage ended in divorce. Mittie Viola HUDSON [Parents] was born on 9 Apr 1888 in Winston Salem, Forsyth, North Carolina. She died on 30 Apr 1981 in Ada, Pontotoc, Oklahoma. She was buried in Five Mile Cemetery, Ada, Pontotoc, Oklahoma. Mittie married George Washington DEATON in 1906. The marriage ended in divorce. M i James Monroe “Jack” DEATON was born on 11 Mar 1907. He died on 17 Aug 1980. M ii Thomas Omar "Dude" DEATON was born on 7 Aug 1909. He died on 18 Jan 2003. M iii Clarence Daniel DEATON was born on 26 Sep 1912. He died on 7 Apr 1946. M iv Charlie Washington DEATON was born on 22 Jul 1914. He died on 6 Aug 1968. 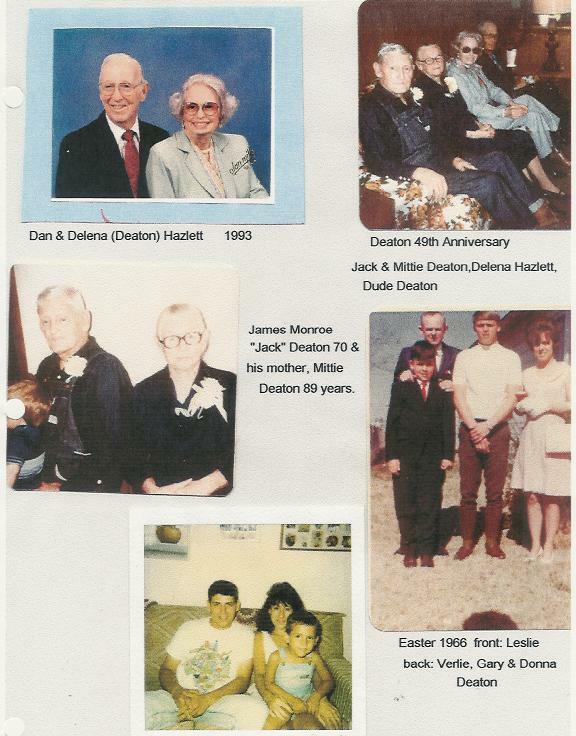 F v Delena Mae “Dee” DEATON was born on 22 Apr 1917. She died on 20 Jan 2007. M vi Volley Lawrence DEATON was born on 28 Mar 1922. He died on 3 Feb 2006. M vii Verlie Eloise "VE" DEATON was born on 18 Mar 1927. Thomas Austin DEATON [Parents] was born on 29 Jan 1839 in , Maury, Tennessee. He died on 25 Sep 1920 in Ada, Pontotoc, Oklahoma. He was buried in Five Mile Cemetery, Happyland, Pontotoc, Oklahoma. Thomas married Lucinda Jane "Luvy" JOHNSON on 3 Sep 1868 in Jackson, Jackson, Arkansas. Lucinda Jane "Luvy" JOHNSON [Parents] was born on 14 Feb 1846 in Rome, Floyd, Georgia. She died on 13 Dec 1937 in Steedman, Pontotoc, Oklahoma. She was buried in Five Mile Cemetery, Happyland, Pontotoc, Oklahoma. Lucinda married Thomas Austin DEATON on 3 Sep 1868 in Jackson, Jackson, Arkansas. M i Samuel Thomas DEATON was born on 15 Aug 1869. F ii Mary T. DEATON was born on 15 Aug 1869. She died on 2 Jul 1958. F iv Lucy Jane DEATON was born on 28 Jan 1873. F v Ida Florence "Flenna" DEATON was born on 16 Sep 1875. F vi Martha Elizabeth "Lizzie” DEATON was born on 5 Apr 1877. M vii George Washington DEATON was born on 7 Dec 1879. He died on 4 Aug 1971. M viii Rev. Joseph William DEATON was born on 25 Sep 1881. He died on 30 Dec 1955. F ix Pearl Izna DEATON was born on 29 Sep 1883. Samuel JOHNSON. Samuel married Rebecca. Rebecca. Rebecca married Samuel JOHNSON. F i Lucinda Jane "Luvy" JOHNSON was born on 14 Feb 1846. She died on 13 Dec 1937. Samuel Thomas DEATON [Parents] was born on 15 Aug 1869 in , Jackson, Arkansas. He was buried in Five Mile Cemetery, Ada, Pontotoc, Oklahoma. Samuel married Alice WATSON in Jul 1891. Alice WATSON was born in 1869 in , , Arkansas. Alice married Samuel Thomas DEATON in Jul 1891. F i Ola Christine DEATON was born on 17 Apr 1892. She died on 2 Apr 1952. F ii Dollie DEATON was born in 1894. M iii Clellan DEATON was born in 1897. He died in 1946. F iv Delena DEATON was born in 1899. M v Clifton L. DEATON was born on 29 Mar 1903. M vii Olen C. "Ode" DEATON "Sr" was born on 21 Jul 1906. He died on 1 Jun 1995. Willard Moore ANDERSON "Sr" [Parents] was born on 17 Jan 1889 in Ozark, Franklin, Arkansas. He died on 19 Jul 1937 in Ada, Pontotoc, Oklahoma. He was buried in Happyland, Pontotoc, Oklahoma. Willard married Ola Christine DEATON on 8 Oct 1911 in , Pontotoc, Oklahoma. Ola Christine DEATON [Parents] was born on 17 Apr 1892 in Indian Territory, Conway, Pontotoc, Oklahoma. She died on 2 Apr 1952 in Ada, Pontotoc, Oklahoma. 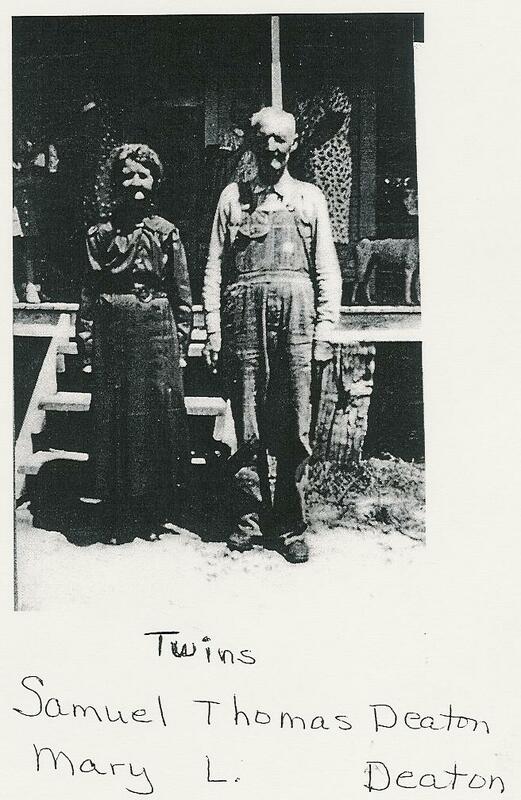 Ola married Willard Moore ANDERSON "Sr" on 8 Oct 1911 in , Pontotoc, Oklahoma. Willard MOORE ANDERSON "Jr" was born on 14 Aug 1912 in Ada, Pontotoc, Oklahoma. He died about 1994 in Ada, Pontotoc, Oklahoma. M ii Wilford Millard ANDERSON was born on 14 Aug 1912. He died on 7 Feb 1990. Robert Franklin ANDERSON was born on 7 Nov 1913 in Ada, Pontotoc, Oklahoma. He died about 1915. F iv Bernice Alpha ANDERSON was born on 8 Oct 1915. She died on 30 Mar 2003. Leon Shelby ANDERSON was born on 13 Feb 1918 in Ada, Pontotoc, Oklahoma. He died in Dec 1968. M vi Hershal ANDERSON was born on 6 Apr 1921. He died on 8 Nov 1998. Herman Vestal ANDERSON was born on 21 Aug 1923 in Ada, Pontotoc, Oklahoma. He died on 10 Jan 1926 in Verden-Pioneer, Grady, Oklahoma. F viii Wilma ANDERSON was born in 1924/1933. M ix Glenn Jay "Andy" ANDERSON was born on 1 Apr 1935. He died on 6 Dec 2012. Charley LAUGHLIN. Charley married Dollie DEATON. 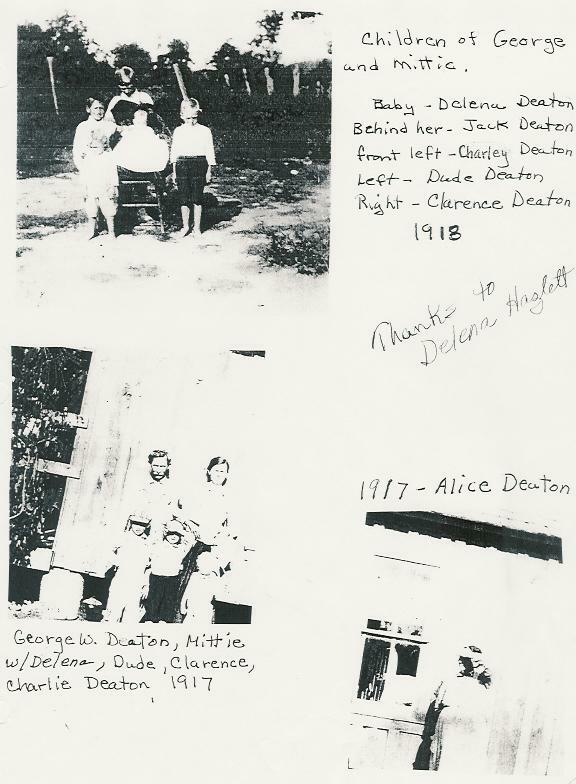 Dollie DEATON [Parents] was born in 1894 in Indian Territory, , Pontotoc, Oklahoma. Dollie married Charley LAUGHLIN. Clellan DEATON [Parents] was born in 1897 in Indian Territory, , Pontotoc, Oklahoma. He died in 1946. He was buried in Memorial Park Cemetery, Ada, Pontotoc, Oklahoma. Clellan married Vivian CAMPBELL. Vivian CAMPBELL was born about 1903 in , , Oklahoma. Vivian married Clellan DEATON. Jim CARNEY. Jim married Delena DEATON. Delena DEATON [Parents] was born in 1899 in Indian Territory, , Pontotoc, Oklahoma. Delena married Jim CARNEY.